Pro-Morsi rioters set fire to Christian youth center, church. 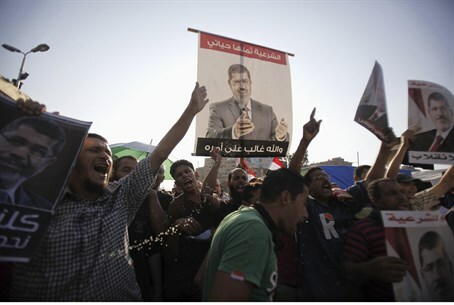 Supporters of ousted Egyptian president Mohammed Morsi have reportedly been lashing out at Christian targets, besides confronting the government. In Fayoum, in Upper Egypt, pro-Morsi supporters set fire to a Christian youth center located next to the Muslim youth center where they had been protesting, according to a report on Ahram Arabic cited by the BBC. Ahram Arabic also reported that pro-Morsi supporters threw fire bombs at the Al-Raey Al-Saleh Church and set three military vehicles on fire. Clashes are ongoing between protesters and military forces. The BBC said that there have been a number of attacks on churches around Egypt Wednesday, including in Minya and Sohag.